Synthetic peptide corresponding to Human DEFB-4 aa 25-61. IHC-P: Uterus and kidney sections. Our Abpromise guarantee covers the use of ab14419 in the following tested applications. WB Use at an assay dependent concentration. Predicted molecular weight: 8 kDa.Can be blocked with Recombinant human DEFB-4 protein (ab69499). 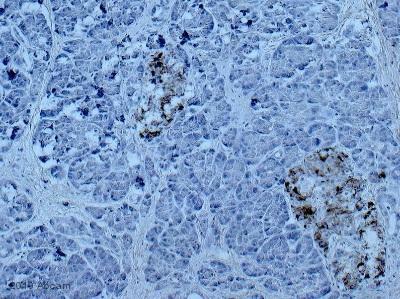 ab14419 staining DEFB-4 in human pancreatic tissue by Immunohistochemistry (Formalin/PFA-fixed paraffin-embedded sections). Tissue was fixed with formaldehyde and a heat mediated antigen retrieval step was performed. Samples were then incubated with the primary antibody at a 1/100 dilution for 1 hour at 25°C. An undiluted HRP-conjugated goat IgG polyclonal was used as the secondary antibody. Publishing research using ab14419? Please let us know so that we can cite the reference in this datasheet. The numbers are based on the expected concentrations after reconstitution. Customer said she can perform a Bradford assay to confirm, no problem. But she is still worried cause she is having no bands. She would like us to find a reason why there is no bands in WB and there is some spots in dot-blot? She asked if these could be related to the gel condition (which is denaturing)? Also, these antibodies detect the denatured form or native form of proteins/standards? "The beta-defensin genes were directly expressed (no tags or leader sequence). Sequences are available (let me know if you require them). After fermentation, centrifugation, cell breakage; the proteins are folded into its active form during the folding/oxidation stage, this is when the disulfide bridges form. Specific processes are proprietary. The beta-defensins have a characteristic 6 cysteine structural motif containing 3 disulfide-bridges." I have tested the performance of your antibody against the denatured forms of my standards, HBD-1 (36aa and 47aa), HBD-2 and HBD-3. Unfortunately these results were negative and the only positive results were the native forms of HBD-1 36 and 47 aa, which gave a clear signal on the dot blot. Thank you for getting back to me with those details, it was very interesting. Unfortunately given that the source of the antisera have not been able to provide me with further details as to the synthesis of the immunising peptides it is difficult for me to comment on whether they have been raised against a correctly folded immunogen. If this was indeed the case then one might speculate that these antibodies only recognise the synthetic peptide and not the native form of the protein. However, checking back to past orders and this antibody is relatively popular and we have not received any complaints as such. I can but speculate that the absence of western or dot blot as applications on the datasheets is a reflection that these antibodies do not recognise their epitopes when immobilised on a membrane. What do you think might be the problem with these beta defensins? Do you have some more useful information about these specific antibodies/antigens conditions of binding ? I am looking forward to hearing from you. We need to solve this case as soon as possible because time is passing by and customer has a deadline to finish her experiments with beta defensins. Has our customer had a chance to test the protein concentrations via Bradford assay? I have unfortunately been unable to locate western blot data. Based on the information it may be that a native western blot system is required. It is also possible these antibodies are not working as expected.